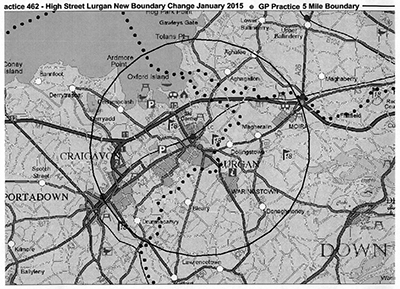 From January 2015 the Practice boundary is now 5 miles. No changes will be made to patients currently outside the boundary but no new patients will be accepted beyond 5 miles - this does not apply to the Lough shore area. Our manager is responsible for the management and administration of the practice and all non-clinical aspects of healthcare in the Surgery. If you have any queries, comments or suggestions about the services offered by the Surgery, she will be happy to discuss these with you. Macmillan Nurse - for patients suffering from cancer. The staff work along with the doctors in providing all the necessary services to patients. Lorraine Brennan, Noreen Hylands, Elaine McComb and Julie Cairns. The Nurses are in attendance during all surgeries, to carry out dressings, take blood samples and give advice etc. They assist the Doctors in caring for patients suffering from diabetes, asthma and monitoring blood pressure treatment. They carry out health checks, advise regarding weight reduction, smoking cessation, coronary risk prevention, travel vaccination and perform cervical smears. Appointments for Practice Nurse are made at reception. The Surgery has for many years been involved in the education of medical students from the Queen's University of Belfast. At periods throughout the year a student will be attached to the practice, and during that time will accompany doctors during surgeries, home visits and clinics. Patients will always be informed that a student is present and their permission obtained beforehand.